Showing 38 articles from March 5, 2013. 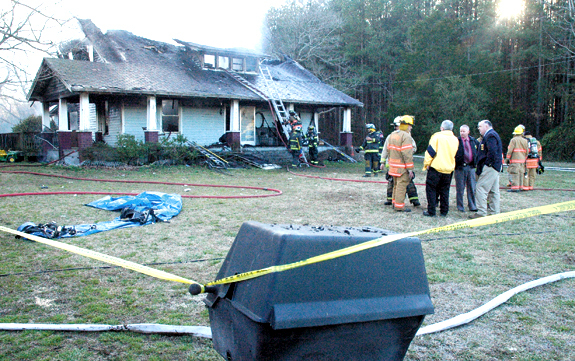 FRANKLIN COUNTY — Investigators continue to probe a Monday afternoon house fire that killed a woman and injured her boyfriend. Firefighters were called out to a conflagration at 2637 Rocky Ford at about 3 p.m., finding the two-story house fully engulfed. For 40th time whistlers to gather here! The 40th International Whistlers Convention will be held April 17 to 21 on the campus of Louisburg College, the site of its origin. Sponsored by the Franklin County Historical Society, Inc., the whistling contestants and visitors this year will represent India, China, Japan, South Korea, Canada, Spain, Russia, Israel and states in the U.S. as far away as Alaska. Keith Henderson, an Elvis Presley tribute artist, lassoes a new fan Saturday night, using The King’s scarf technique. 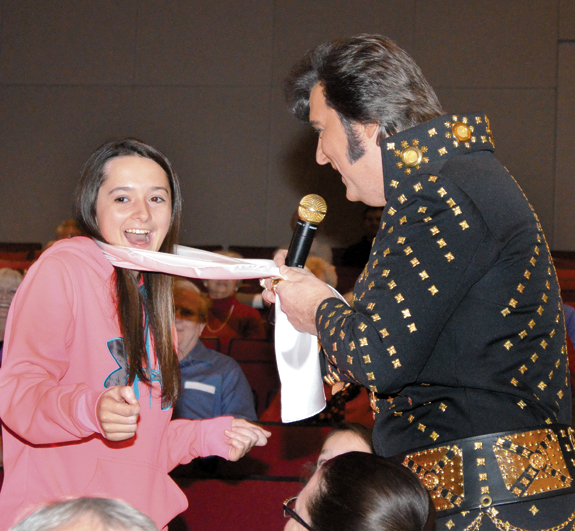 Henderson, who lives in Chapel Hill, visited Louisburg College to help raise funds for the Louisburg Lion’s Club and the Happy Camper program — and while he was here, he “roped in” this new fan, Danielle Thomas, 16, of Wake Forest during one of his many forays into the audience. BUNN-O-NIANS. 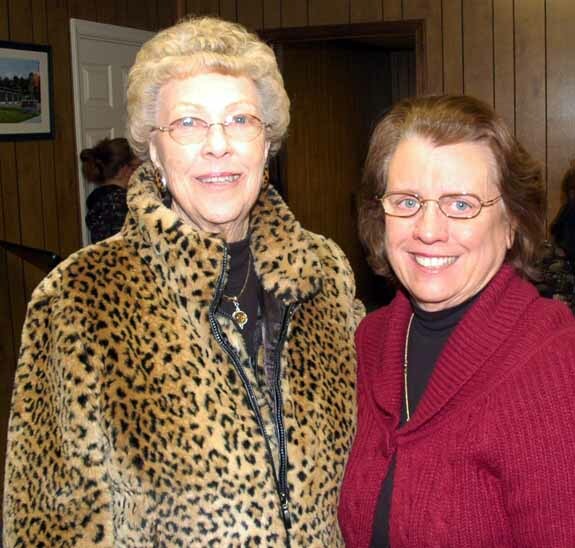 Bunn Mayor Marsha Strawbridge, right, and life-long resident Teenie Wilder. BUNN — Residents and officials celebrated the town’s centennial, with lessons on history and an eye toward the future. The town was founded on March 3, 1913 and one hundred years and a day later, the town’s Board of Commissioners, residents and civic leaders celebrated, kicking off a year-long string of festivities. 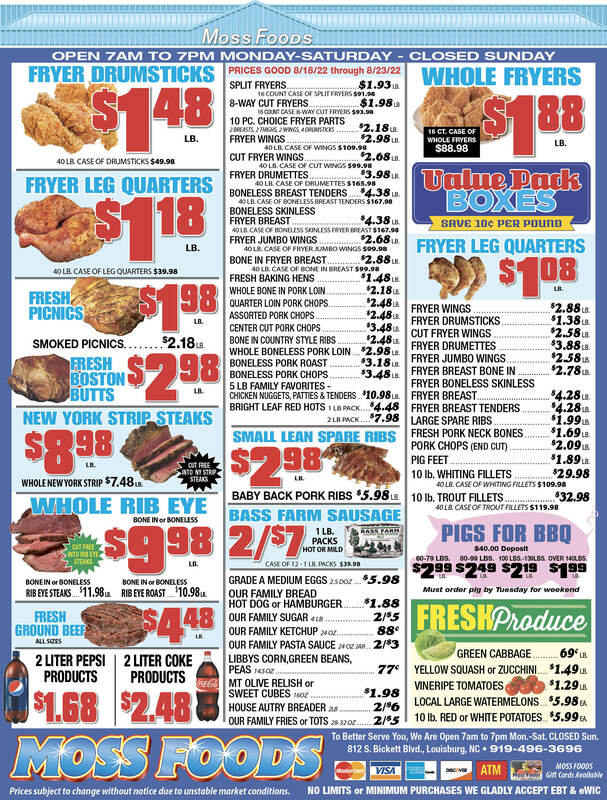 GOOD MORNING: Didja see that picture of my grandson, U.S. Marine PFC Wesley Street Johnson, son of Wesley and Jana Street Johnson, in the Feb. 27th MIDWEEK EDITION of The Franklin Times? Seeing “Street” all decked out in his dress uniform kind of reminded me of my WWII days as a Navy combat air crewman, flying with a Marine pilot. 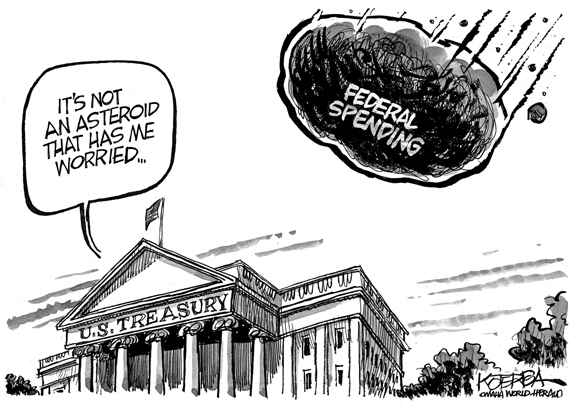 In today’s fast-paced, hyper-partisan, usually negative political world, it’s not easy to make your opinions known to those who make the rules and regulations. 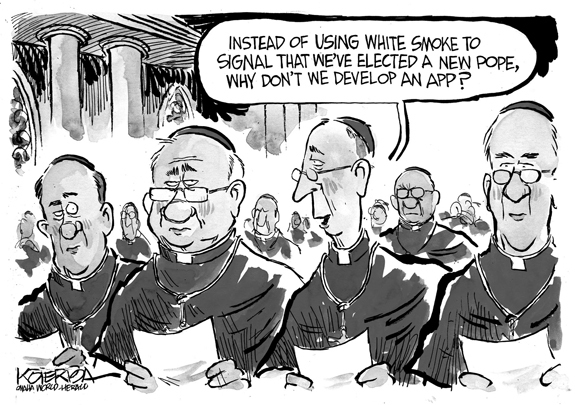 That’s sad since this nation was founded on the ideal of participatory government where the governed have input -- and, more importantly, influence -- on the laws and regulations that affect their daily lives. While doing research for a story about severe weather preparedness, I had to admit I’m not prepared — at all. My gas tank is nearly empty. I don’t have much cash in hand (so robbing me would be practice). I don’t have a battery-powered radio. LOUISBURG - Funeral services for Effie William German, 68, who died Sunday, March 3, 2013, will be held at 12 p.m. Saturday, March 9, in the chapel on the campus of Louisburg College, with the Rev. Dr. Charles A. Murrill officiating. LOUISBURG - Ellene Dent Dowdy, 81, of Monroe, formerly of Franklin County, died Wednesday, Feb. 27, 2013. A memorial service will be held Saturday, March 9, at 2 p.m. at Lancaster Funeral and Cremation Services Chapel, with Pastor Barbara Watkins officiating. The family will receive friends immediately following the service. WAKE FOREST - Hazel Woodlief Keith, 85, died Saturday, March 2, 2013 at Rex Hospital. Funeral services will be held at 2 p.m. today (Wednesday, March 6) at Glen Royal Baptist Church. Burial will follow in the Wake Forest Cemetery. FRANKLINTON – Willard Edward Radford Sr., 92, died Tuesday morning, March 5, 2013. A funeral service will be held 2 p.m. Thursday at the Strickland Funeral Home Chapel in Louisburg. Burial will follow at Fairview Cemetery in Franklinton. GARNER--Surrounded by her loving family, Jewel Wester Butler, 79, went home to be with the Lord on Friday evening, March 1, after a courageous battle with cancer. Born in Louisburg, NC, to the late George and Elizabeth Wester, she was loved and revered by many. Her enduring smile and inner spirit will be remembered by all who knew her. FREDERICKSBURG, VA - Delores Tiller Stallings, 61, of Spotsylvania County, passed away peacefully with her husband and children by her side on Monday, March 4, 2013 at University of VA Hospital. LOUISBURG – Peggy Marie Hester, 72, of Louisburg, died Sunday night. Peggy was a daughter of the late L.C. and Izela Quinn. She was preceded in death by her sister, Joyce Stinnett, and brother, J.B. Quinn. LOUISBURG - Lois Hagwood Hensley, 86, of Louisburg, died Monday, March 04, 2013, at Central Harnett Hospital. She was born November 9, 1926, to the late Charlie and Martha Hagwood. She was also preceded in death by her husbands, Elton Drake Griffin and Paul Willard Hensley, and her daughter, Paula Jo Hensley. She was a long-time member of St. Paul’s Episcopal Church. TAYLOR FOR TWO. 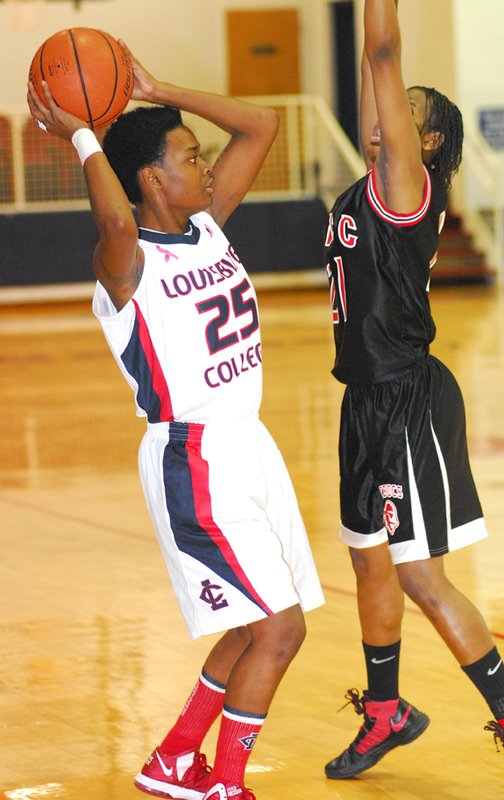 Louisburg College’s Justin Taylor (with ball) drives for a basket during the Lady Hurricanes’ home setback to Catawba Valley CC. LOUISBURG -- Of Louisburg College’s three women’s basketball losses this season, two of them have come against undefeated Catawba Valley Community College -- a shortfall that can be easily corrected at this coming weekend’s Region X Tournament. The Lady Hurricanes had a chance to tie Catawba Valley for the regular season crown during last Saturday’s home finale at Taylor Center on the LC campus. 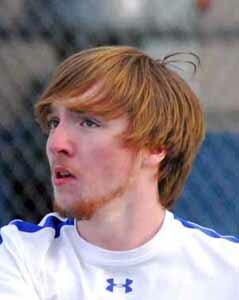 ALSTON ON THE ATTACK. Bunn’s Johnathan Alston drives for two points during the Wildcats’ road playoff victory last Friday against Farmville Central. FARMVILLE -- Gerald Melton tried not to take too much offense when a media member asked if his Bunn High School boys basketball squad was ‘in awe’ of the Kinston Vikings. “We’re not in awe of anybody,’’ Melton said as he tried to bite his lip as part of Monday’s press conference for the Class 3-A East Regional Basketball Playoffs in Fayetteville. COMPLETE-GAME COBURN. 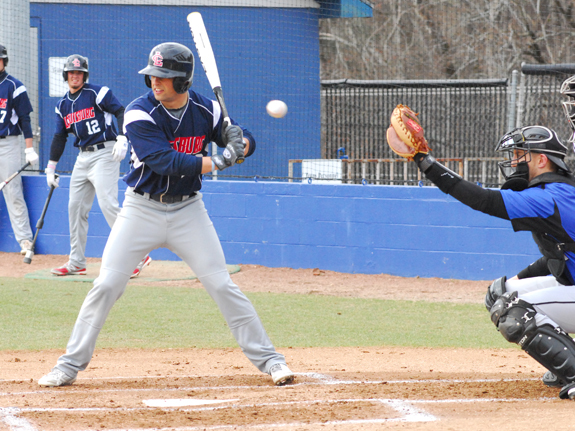 Louisburg native Jeremy Coburn helped Louisburg College sweep foe Anne Arundel last weekend at Frazier Field. 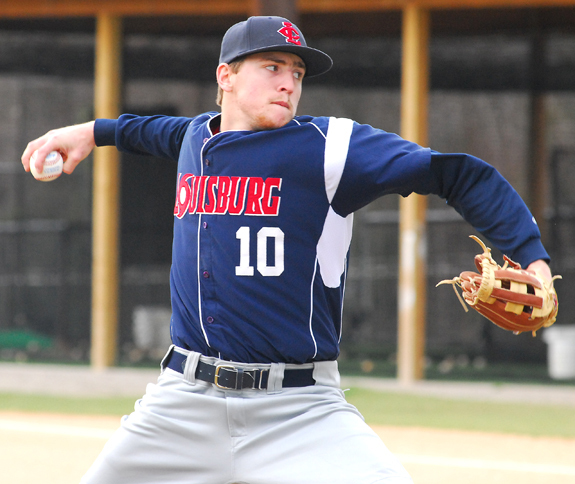 LOUISBURG -- After apprenticing on last year’s pitching-loaded squad, Jeremy Coburn is making a play to earn a spot in Louisburg College’s weekend rotation this season. Coburn, a sophomore right-hander who prepped at Louisburg High School, made his case for league weekend work stronger with a solid performance last Saturday as part of a non-region doubleheader sweep against Anne Arundel College from Maryland. BUNN -- Bunn High School delivered a key early-season baseball victory as the Wildcats thumped South Granville last Friday by an 11-2 margin. The Wildcats pounded out nine hits, including two each from Nick Sanders, Tony Alaffita and Spencer Brickhouse. Both Sanders and Brickhouse are freshmen. CHAPEL HILL -- Here are this week’s pairings for the North Carolina High School Athletic Association’s Regional Basketball Tournaments. Sectional winners from the East will be going to Fayetteville for the third consecutive year. The games will be played at both the Crown Coliseum and the Crown Arena in Fayetteville. 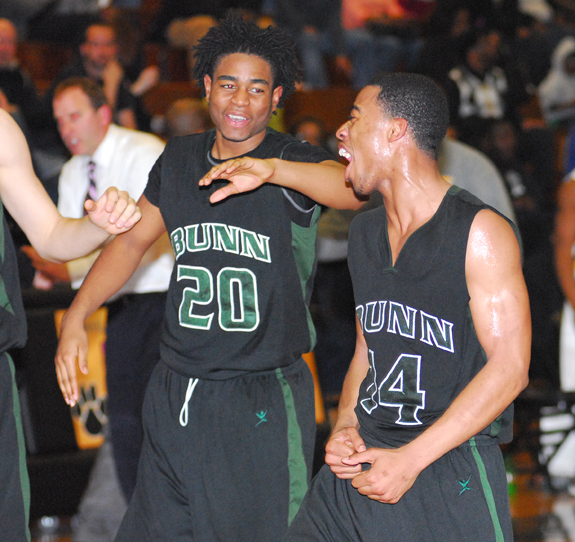 BUNN VS. KINSTON, PART THREE. 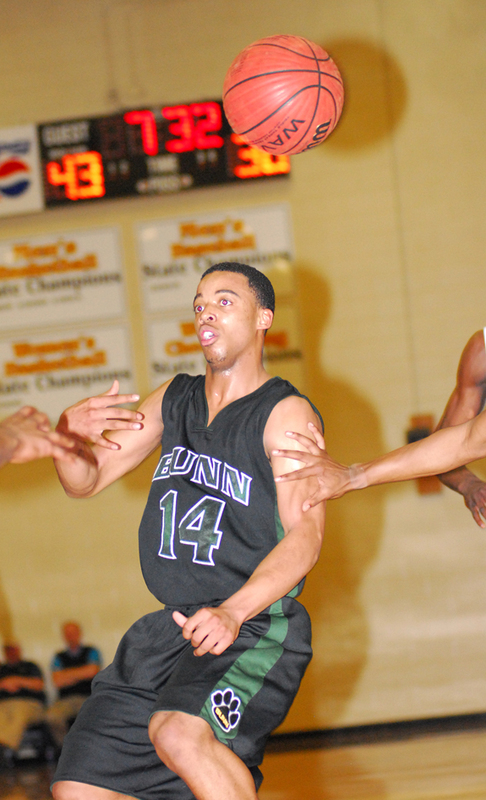 Bunn’s Whitney Bunn (right) drives past Kinston’s Takerian Harper during the teams’ meeting in December at the Bunn Christmas Basketball Tournament. 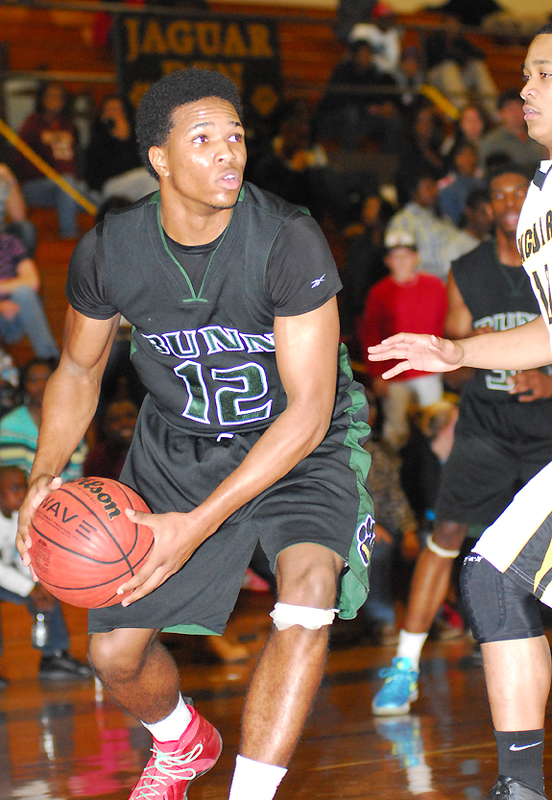 BUNN -- Rare is the occasion when both clubs enter a basketball game feeling like they have something to prove against an opponent. But that will be the case when Bunn tangles with Kinston -- again -- on Friday in the quarterfinals of the Class 3-A State Girls Playoffs at the Crown Arena in Fayetteville. LOUISBURG -- The #2 Louisburg College men’s basketball team closed out its regular season with a 92-81 win over Patrick Henry Community College last Saturday evening at Taylor Center on the LC campus. The win upped the Hurricanes’ overall record to 29-1, 15-1 in conference play. LaShawn Alexander and Kevin Williams led the way for the ‘Canes as they each scored 21 in the conference win. GREENVILLE -- David Lucroy struck out a career-high nine batters, while Jack Reinheimer and Travis Watkins drove in multiple runs helping East Carolina University complete a three-game baseball sweep over St. John’s on Sunday afternoon, 7-3, at Lewis Field at Clark-LeClair Stadium. With the win, the Pirates improve to 6-4, while the Red Storm drops to 1-10. RALEIGH -- The Carolina Hurricanes hold continue to hold first place in the Southeast Division of the National Hockey League and third place overall in the Eastern Conference. Three consecutive wins have solidified their place within the standings. The Canes’ beat the Pittsburgh Penguins 4-1 last Thursday and defeated the Florida Panthers 6-2 as the Panthers gave up three goals on three shots in the first period. FRANKLINTON -- Even though he is only eight years old, Ryan Billock Jr. has already experienced the thrill of a lifetime. 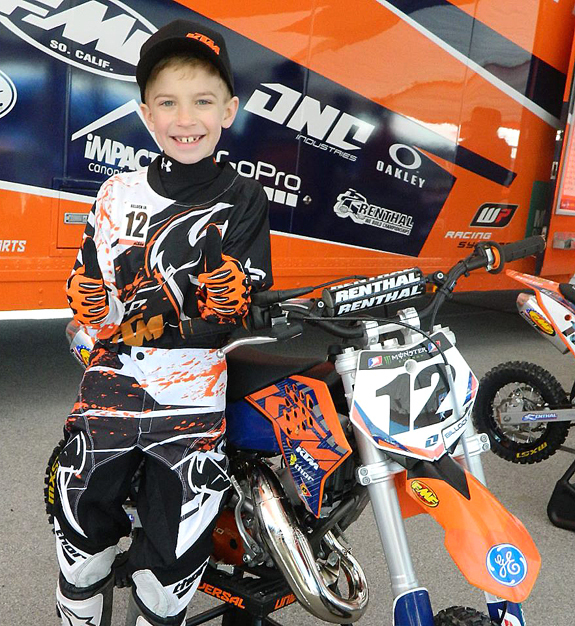 A second-grader at Franklinton Elementary School, Billock recently traveled to Dallas to attend the 2013 KTM Junior Supercross Challenge. 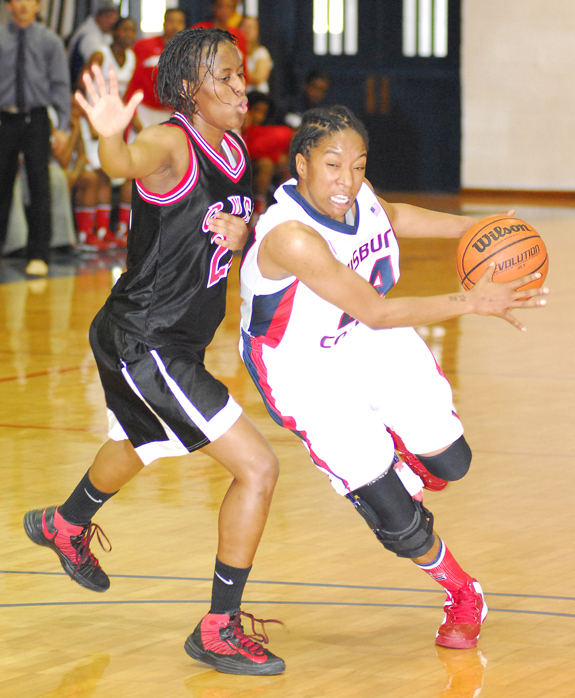 Louisburg College’s Jazmine Parker (left) tries to find an open teammate during last Saturday’s home game against Catawba Valley Community College at Taylor Center on the LC campus. Louisburg College’s Tim Mansfield looks over a pitch during last Saturday’s home doubleheader. Bunn’s Deshawn High delivers a perfect pass to a teammate for a layup during last Friday’s decision over host Farmville in the third round of the Class 2-A State Hoops Playoffs. Bunn’s Deshawn High (right) celebrates while being congratulated by teammate Javonte Perry following Friday’s decision at Farmville Central in the third round of the state playoffs. Mr. and Mrs. Kevin N. Wester of Louisburg are pleased to announce the birth of their daughter, Brinley Reagan Wester, born at Duke University Hospital on Dec. 6, 2012. Maternal grandparents are Karen Lilley of Dunn and W. B. Lilley of Henderson. Paternal grandparents are Vann and Jill Wester of Louisburg. Trees are great addition, especially when they’re free! Trees are a wonderful addition to any landscape by not only providing an aesthetic complement but by increasing the quality of life and improving overall health. 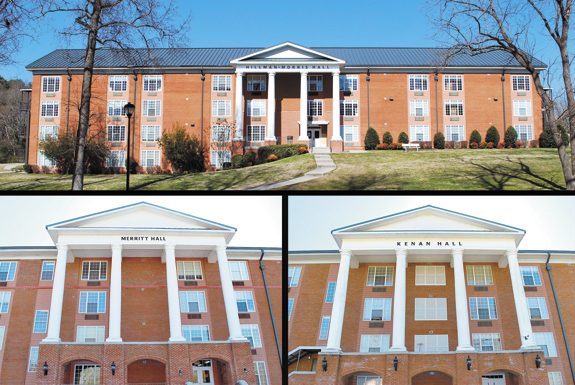 Louisburg College officials have finalized the purchase of three of the school’s residence halls (above). The buildings once again became the property of the college via a loan from the U.S. Department of Agriculture’s Rural Development division. The buildings involved were Kenan Hall, Merritt Hall and Hillman-Morris Hall. YOUNGSVILLE — Joyce Johnston was an unlikely celebrity. But since 2000, Johnston, better known as Dancin’ Granny, did her best to raise the spirits of the Carolina Hurricanes and their fans, dancing most famously to Flo Rida’s bass-heavy hit, “Low” during breaks in the action at Raleigh’s PNC arena. Sheriff’s deputies arrested a Louisburg area man accused of stealing dirt bikes. Davis Anthony Ray Jr., 18, was charged with three counts of felony larceny and possession of stolen property. A resident of Rex Place near Louisburg reported on Feb. 18 that someone stole three bikes from a shed area behind a home. The Franklin Committee of 100 will meet at 8 a.m. Friday, March 8, in the board of Room of Wake Electric in Youngsville. On the agenda are consideration of a revolving loan for Palziv of Louisburg and restructing Phillip Young’s loan.